Holly, who is three, absolutely loved Walter's Wonderful Web, a board book that she has really taken as her own - she sits and "reads" it to herself and points out the different shapes as she goes! 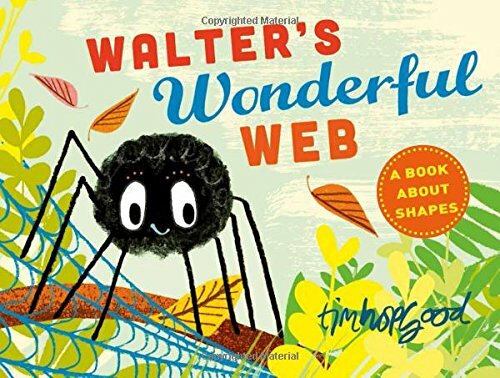 Walter's Wonderful Web, by Tim Hopgood is a tale of a sad spider who is on a mission to make better cobwebs! Walter's webs are a bit wibbly wobbly and they keep being wooshed away by the wind. Walter experiments with lots of different designs which leads him to explore different shapes. Eventually, just when you think he is about to give up, Walter discovers the secret to a truly wonderful web. Walter's Wonderful Web is a gentle, touching tale but with a brilliant learning theme - shapes. On each page that features a new web, the shape of the web is very clearly illustrated and the name of the shape is written in clear, bold lettering. At the end of the book there is a colourful page of the plain shapes with a series of questions for you to ask and answer with your child. This helps your child to identify and differentiate shapes - a basic mathematical reasoning challenge that your child will be far more receptive too once you've read the story together. I loved this book and I can see why Holly is so taken with it; the illustrations are beautiful and fun with hints of autumn with all the falling leaves. We're now going to search out more of Tim Hopgood's board books. Walter's Wonderful Web was published last week by Macmillan Children's Books.